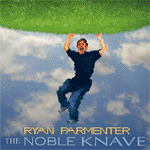 Parmenter, Ryan "The Noble Knave"
Solo album from Eyestrings leader. 13 songs in various styles but all filtered through Ryan's 'prog' sensibilities. Like a lighter version of his songs for Eyestrings. The arrangements are strictly one-man-show style with lots of samples but since the songwriting is so strong that doesn't really detract from the enjoyment of this disc. If you like your prog on the lighter side (certainly Todd Rundgren could be a reference) then this is a good addition to your collection. Notify me of updates to Parmenter, Ryan "The Noble Knave"